The last few years have seen renewed research into Island mills, revealing a considerable amount of unpublished material. One recent discovery concerns a unique design and engineering project undertaken at Wootton Mill in the 1890s. Towards the end of the 19th century Island mills found themselves losing business to suppliers of white flour produced by the latest roller mill technology. A few of the larger mills eventually decided they had little option but to purchase a roller system. Roller mills bore little relation to stone milling. The 'gradual reduction' system revolved around a series of six or more steel roller units accompanied by a range of dressing machinery, all interconnected with automated stock transport. The plant was complex and expensive, manufactured and installed by a handful of specialist companies. In 1891 William Souter of Wootton Mill took the extraordinary decision to design his own roller mill and have it engineered on the Island. This may have been be the only attempt at a 'home made' system in hundreds of eventual installations in Britain. It was an ambitious project. Souter teamed up with millwrights Way and Minns of Newport who built the machinery and played a major part in the design of each unit. They would have needed access to a working roller mill and this was probably provided by Home Mill, one of only two installations on the Island at the time. Details of the units are unknown but innovation extended to a redesign of the fluted 'break' rolls, a crucial element in the roller system. Wootton roller mill started production in March 1892 and ran at least until the late 1920s, probably longer. With a design capacity of 2.5 sack per hour it compared with 4 sacks at Home Mill and a specified 1.5 sacks for the plant still on display at Calbourne. No doubt William Souter's decision to build locally was largely based on economic considerations. Nevertheless he may have been genuine in claiming it had much to do with his support for Island business, expressing great pride that his roller mill was the product of local expertise. With around two thousand listed buildings on the Island it is inevitable that some of them will be in a poor state, perhaps in serious condition. The authorities are aware of some examples but have no way of knowing the full extent of the problem. It has now been suggested that the council compile a register of buildings which are in need of attention. Buildings requiring attention will probably mainly consist of unoccupied residences or outbuildings such as barns or granaries. Some counties already have a register. Hampshire Council publish a detailed list of 'threatened' buildings with over two hundred entries. English Heritage have a national register of 'Buildings at Risk'. This refers to important buildings where major work is urgently required. There may be examples in this category yet to be recorded on the Island. The Island Conservation and Archaeology services will shortly be meeting to arrive at a method of identifying buildings which could be considered in poor or serious condition. One idea is to encourage knowledgeable locals to survey their own areas and report examples. A form would be distributed to enable people to identify features within a standard terminology. The register would contain these details and categorise each structure as to its importance and the urgency of work required. Quite what can be done about poorly maintained buildings once identified is a different matter. Local authorities have some financial resources to carry out repairs but the sums available are modest. They have legal powers to force owners to repair properties which technically fall within the 'Buildings at Risk' category, but many buildings, although in need of maintenance, may not meet that criteria. In some cases property owners can apply for English Heritage grants although this only applies to Grade I and Grade II* buildings, which represent less than 10% of Island listings. A register will certainly be useful in showing the general state of the Island's historic buildings and will at least raise an awareness. The survey may also highlight those structures which are not only in need of attention but, as yet, not even listed. In 2002 the County Record Office purchased the anonymous travelling notes of a Frenchman touring the Island, sometime around 1880. There has yet to be a complete translation but some recent sections have now been released. Unlike similar English works, concentrating on our 'picturesque Isle', the Frenchman takes a look at the people and their habits, not least within Island tourist establishments, including the Kings Head Hotel at Sandown. Much of his writing appears to be comments on general English behaviour, although it's debatable whether Victorian Wight typified the nation. Where he makes specific reference to the Island, he is not always complimentary. His comments on Island lodgings have a ring of truth: "First of all it's the inevitable lodging house owner with their professional and traditional rapacity and for whom the traveller is a pawn and whose ancient right to a godsend gives him the entire ownership. Everyone here more or less makes it their profession to lodge tourists and as the season only lasts two or three months, they make you pay for all the visitors who do not come during the rest of the year." His disenchantment with Island hospitality is reinforced by a stay at Sandown. Having missed the last train to Ventnor ".... 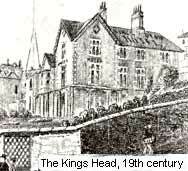 I had to pay for a night spent at the King's Head hotel, in a more than modest room, 5 shillings first of all for the bed then two shillings for service, 1 shilling for the boot-cleaning which did not prevent the maid responsible for waking me still tendering her hand at the start. Not having a sixpence, I had to give her a shilling. Grand total: 9 shillings or 11 francs 29 for one night. It goes without saying that the food is in keeping. Do not venture to make the slightest comment when they present you with the bill. You will expose yourself to hearing it said by this robber of tourists, "You are not a 'Gentleman'", which is the biggest insult which you can proffer an Englishman." It is not all bad news. He can be complimentary of Island scenery and approaches other experiences with occasional humour. The value of the work lies in its askance view of Island life, and a useful attention to detail.